In 2010, I left clinical rehabilitation and performance training. While I love my current job, I do miss the clinical aspect, which is why I seize opportunities to take on random clients with complex issues. I’ve never written about my clients, but this case is so common, yet complex, that I thought my readers might be challenged with similar clients/athletes, or might be experiencing similar issues themselves. Here is a runner’s story that went from marathon training, to painful walking and an inability to run. Her experiences with continued failed treatment and the road we have taken to get her back to training and setting personal records. “I was an athlete my whole life, but started distance running in January 2010 to train for my first half marathon. I ran without pain for a year and a half until September 2012 while I was training for my second full marathon. My pain began with a dull knee pain. I first sought help from the walk in sports medicine clinic. The athletic trainer told me to stretch my hamstrings and gave me a few exercises to strengthen my hips, but told me I could continue running as long as it wasn’t too painful. I followed his advice, but the pain kept getting worse. Subsequently, I made an appointment with an Orthopedist. The orthopedist diagnosed me with hamstring tendonitis and said I could continue running as long as the pain wasn’t too bad, but that I should work to correct running form. I was referred to another clinical athletic trainer who treated me with muscle stim and recognized weakness in my hips and hamstrings. He suggested that I focus intensely on stretching my hamstrings and that I change my running form from a heel to forefoot strike, to reduce the load on my hamstrings. Following this advice did not help and eventually pain developed in the neck and mid-back. 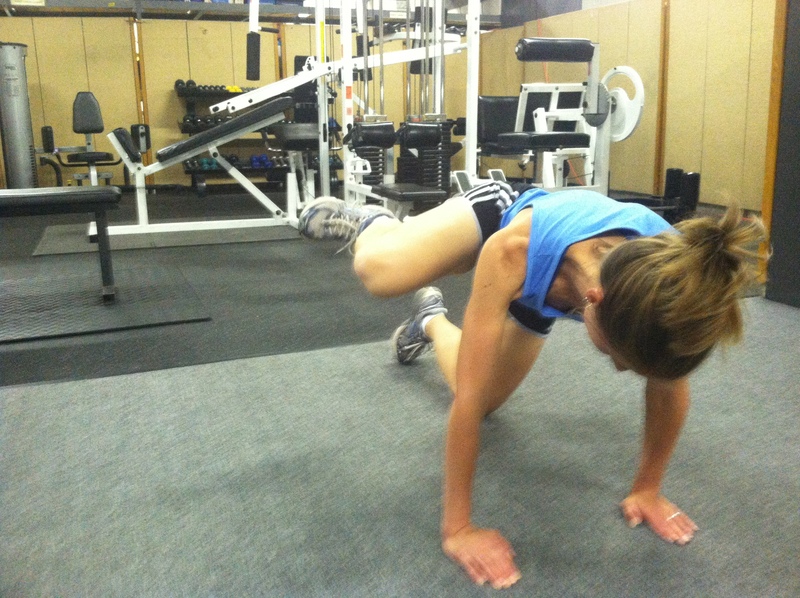 I just kept getting new pain – neck, mid-back, lower back, hips, and hamstrings. The only thing that felt ok was walking—but eventually the sharp pain in my hips even limited my ability to walk. At this point I grew concerned and made an appointment with my primary care physician in March, who did some lab work but didn’t find anything. That physician referred me to a physical therapist, but he didn’t feel comfortable prescribing much of anything, since both back flexion and extension were causing me pain. Eventually the postural training failed as well. She outlined a history, as summarized above, however, something very unique to her was she was diagnosed with a hormonal imbalance, which as you will read, comes in to play later. I performed a physical examination and found special tests for soft and bony tissue to be unremarkable. Thus, far she had non-specific multi-segmental pain. Her pain patterns and complaints were so indistinct that I even evaluated for potential malingering using Gordon Waddell’s (1980) non-organic pain patterns. This too was negative. I did a full body movement assessment to evaluate for potential arthokinematic and neuromuscular dysfunction. If dysfunction were present specific compensatory patterns would emerge. This assessment was positive for a large number of breakdowns in the kinetic chain. Through the entire evaluation I identified the following arthrokinematic and neuromuscular dysfunctions. Overall, she had signs and symptoms of many injuries; from facet arthropathy to PFPS to cervical dystonia, but rather than treat the injury, I only cared about the dysfunction and treated as such. We worked 3-5 days per week correcting imbalances. I addressed the above mentioned neuromuscular hypertonicity using, muscle energy, active release technique, positional release technique, and myofascial release. I coupled the neuromuscular work by applying joint mobilizations or Mulligan’s mobilizations to hypomobile joints. Together this treatment would increase dynamic range of motion. When decreasing neural impulse to hypertonic muscles it is prudent to increase neural drive to the hypotonic muscles. This was done with focused isolated strengthening of weak muscles and positional isometrics. I also added light multi-segmented strengthening to facilitate neuromuscular control through dynamic and multi-planar movement. As you can see this is a lot of work and obviously we could not do all of this every single day. We targeted the biggest issues and switched it up from day to day. Each session would last 45-60 minutes. We remained in this phase for approximately 6 weeks. By the end of this phase I no longer had to perform manual therapy. Once we had corrected the imbalance, the goal is to increase neuromuscular demand while ensuring proper mechanics during movement was maintained. A simple periodization program alternating between corrective exercise and strengthening was applied. For example, the corrective day might include single leg bridge, clams, and ball Y’s and T’s. The strengthening day, might include, single leg squats, RDLs and seated rows. Because we had corrected muscle imbalance we could now reintroduce running. The goal for running was threefold: 1- reestablish cardiorespiratory endurance. 2- Ensure the corrective exercise done in phase 1 was good enough to maintain proper mechanics while running and 3- to see if she can perform pain free running. We began with slow, steady state cardio programming. All training runs were preceded by 15-20 minutes of corrective exercise. At first it was no more than 1 or 2 miles per week. We ramped this up pretty quickly as tolerated. By the end of another 4-6 weeks (early/mid-August) we would get to 3 mile runs and up to 6-7 miles per week. She did not run faster than a 9:30 pace. There would be occasional set-backs lasting 24-72 hours and discovered that she may need longer recovery periods. This is where her physician-diagnosed hormonal imbalance came in to play. The pituitary gland, specifically the anterior lob, is responsible for secretion of somatotrophins or more commonly known as human growth hormone. With suppressed hormonal secretion her body is subject to slight delays in tissue regeneration. Subsequently, we have a cascade effect of tissue breakdown that is unable to regenerate as fast as normal, which can lead to injury. To combat this, we had to allot for more recovery time between training days. By now, she had regained enough motor control and demonstrated neuromuscular command that we can begin incorporating higher intensity work like power, speed, agility, and quickness (SAQ) training. We did not forget what we had done in phase I and Phase II and would continue performing these exercises 1-2 days per week. The primary objective when performing power, speed, quickness, and strengthening was to ensure she did not demonstrate poor movement patterns. If she did, the exercise was too intense and needed regression. The secondary objective was performance enhancement. An example of exercises we might perform in this phase are power step-ups, box jumps, split squat jumps, ice skaters, and speed ladder work. The speed and intensity at which we perform these exercises were dependent on her ability to control the movement with proper mechanics and muscle firing patterns. Again we followed an undulating periodization approach, where corrective, strength, speed, and power work was alternated throughout the week. We also began to increase running intensity and distance. We began with short tempo and interval training runs. 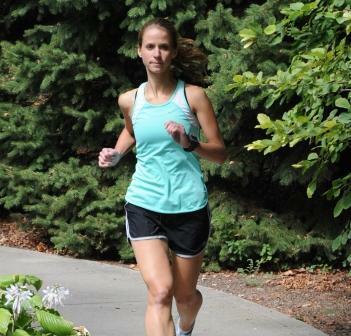 The goal was to reduce her pace from 9:30-10 minutes / mile down to 8:15-8:45 minutes/mile. While rest and inactivity does lead to overall deconditioning, it takes longer for the cardiorespiratory system to become deconditioned when compared to the neuromuscular system. Thus, getting her back to an 8:30 mile pace was fairly easy to achieve. As tolerated we introduced longer runs (5-6 miles). At the end of this phase, I felt confident enough to challenge running to a pre-injury pace. This meant running a 5k at sub 24 minutes. This is the final phase. As of mid-October, we have scaled back substantially on corrective exercise (although, we still do it on occasion) and have primarily been focused on performance gains. Daily workouts are now focused on strength, power, and SAQ. No matter what, all training sessions begin and end with foam rolling and stretching (either static, active, or dynamic). We have slowly increased pace of runs through manipulation on/off times and intensity, and she is now back to pre-injury running pace. In the coming weeks and months we will continue to work toward half- marathon distance and increase speed over the duration of 13.1 miles. We have two ultimate goals that I am optimistic we will achieve: Continue pain free running and set a PR in the Illinois half marathon on April 26, 2014. I am amazed at the progress we have made over the past 6 months without surgery, drugs, bracing, taping, or even ice. I am a stronger athlete now than I ever was, and hope others who relate to my case can benefit from Josh’s extensive knowledge and dedication to treating his clients. Nice work josh. I am jealous of the time you had to dedicate to one person. Wish I could spend so much time with one person but tough in my setting. keep up the great work. You said it perfectly Jay, nothing spectacular, just ability to spend the time needed. I also wanted to mention thank you for sharing and interesting case with the pituitary condition. Not everyone would think that would have an impact on recovery, but obviously a very important part of her rehab program. Reblogged this on Physical Therapy . Similar story to my life for the past 2 years…always been a runner/athlete (track & field, swimming, field hockey in high school, cross country in college, 5Ks for fun post college). Ran my first half marathon in April 2014 & had already signed up for my second in October 2014…August 2014 started with moderate pain in my low back/right SI joint, pushed through not wanting to lose out on the registration money for the October 2014 race…but then significantly backed off of running/body weight training due to pain and nursing school. Have seen a nurse practioner, orthopedic massage therapist and physical therapist…considering a better/more experienced physical therapy session or chiropractic. Pain some days is debilitating to sit up out of bed, roll over in bed, or walk to the bathroom in the night. Pain does seem to be slightly alleviated with walking/movement but my stride and gait have changed dramatically. Any suggestions of who/where to visit for evaluation/support near the Scranton, PA/Binghamton, NY area? Sending you an email, Bridgette! This story is similar to mine. Diagnosed with bilateral pfp syndrome. Misdiagnosed as arthristis six months ago. Had MRI and x ray to confirm diagnosis. Starting pt this week. Would value your input on this condition and what is long term outcome. Very active all my life, running, spin, weight train, and yoga. Now I cannot do any of these actives. My only advice is to be consistent with your rehab plan and continue to fix the problem. This is not about resolving pain. This is about fixing the problem that caused the pain. This takes time.